For years, this expert has explored the authenticity of rare antiques. 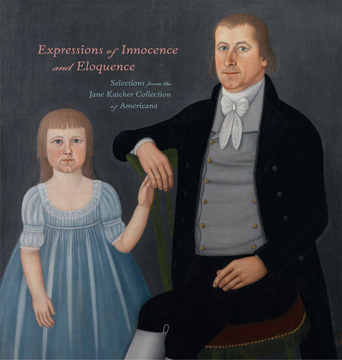 Expressions of Innocence and Eloquence feature observations by the Alice and Allan Kaplan senior curator at the Yale University Art Gallery, Robin Jaffee Frank. Antique American paintings, analyzed within Jaffee-Frank's contributing chapter, are also featured throughout JaneKatchercollection.com. This scholar's expertise, stemming from distinguished exploration catalogues and traveling exhibitions, is displayed in "Portraits of Children" in the coveted book for purchase and for viewing throughout the web site. Admire the beauty and delicately hand painted creations from various cultures. Learn about the origin of antique American folk paintings while viewing newly acquired pieces at JaneKatchercollection.com. Expressions of Innocence and Eloquence offers more than just photos of antiqued objects. Essays from contributing experts in the field of antiquing and art exhibitions share their vast knowledge of Americana and the origins of works created during the mid eighteenth to the mid nineteenth centuries, such as antique American folk paintings. Enthusiasts of antiques can browse through a broad range of traditional facts and speculations, while admiring the beauty of history among the catalog pages. Much to the delight of those whose passion for antiques is apparent, JaneKatchercollection.com also features many items discussed in the book, as well as recently acquired treasures. Find information about historical objects and links to additional information about contributing authors, such as Jane Katcher and Robin Jaffee Frank. Antique American paintings and traditional art histories have been researched and unveiled.